For Meryem Cherkaoui, becoming a top-flight chef in Morocco has been no easy journey. With the restaurant industry being so male-dominated, it means few women ever get the chance to head their own restaurant. But Meryem was never going to let that keep her from pursuing her dream. “I worked and I never thought that because I was a woman, that I was different from the others – because I swear by only one thing: work,” she told me during an interview in her studio kitchen as she sliced a lobster like fresh bread. A matter of perspective, Meryem has used this mode of thinking to smash the boundaries of the industry’s demanding path. Through intensive training in France under Nouvelle Cuisine-styled Chef Paul Bocuse, to founding her own restaurant in the intimate seaside city of Casablanca, Meryem has not only helped change the perspective of women in the global kitchen – but in Moroccan society too. According to data taken in 2012, the latest year for which this type of data is available, women make up for just under 20% of the global chef workforce. “Maybe it’s my character & my personality which made me affirm myself,” Meryem told me in response to a question about the difficulties she faced as a female becoming a chef. That “change” is being felt in the workplace and in society. Today, women in Morocco have more of a voice – a number of laws have been passed to assert them more rights, including anti-violence against women legislations. 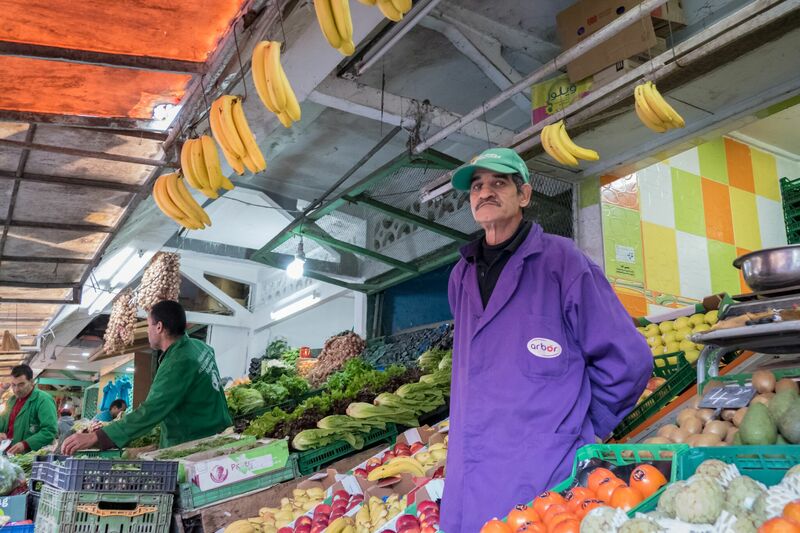 Our first meeting with Meryem was inside one of Casablanca’s many markets. A typically male-dominated area, say for the women that run natural beauty product stores and sell argan oil, the market went out of its way to accommodate Meryem. Every male vendor that we spoke to showed nothing but respect for her, it was a sign of a changing climate – a changing attitude towards women in society. Within her kitchen, Meryem ran the show. 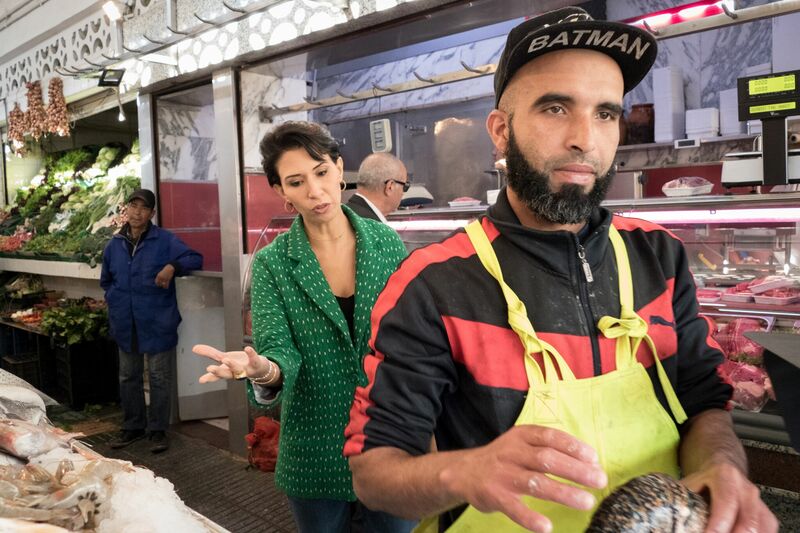 Often directing her husband and accomplished chef in his own right, Philippe Pesneau, to bring certain local ingredients to the chopping board that added to the flavour of her Moroccan-French fusion lobster and couscous dish. Meryem exerted an air of authority, yet held an affable smile that brought you up to her level when in conversation. Her dish, a zesty but smooth take on a traditional Moroccan recipe – matched her personality. “Using flavours from her childhood, paired with her French cooking background, Meryem broke down Moroccan cooking and transformed it,” Philippe told me. Transforming both a cuisine and industry, Meryem has inspired a new generation of female chefs to take back the kitchen and follow their dream. “I see the new generation of women coming and I like it. There are more and more women,” Meryem said. Finding her personality within food, Meryem created something wholly unique. By sticking to both her own childhood and her being, she discovered a form of cooking that separated her from her male counterparts, and brought together an all more appealing case for why women should, and can, lead the kitchen.